A double bridle is a bridle with two bits and not two bridles as some riders suppose. It has two headpieces and two pairs of reins. The extra headpiece, known as a slip head, is really two straps connected by a buckle with cheek attachments for a bit on each end. It isn’t as wide as a normal headpiece and has no throat lash attached. The bridle image shows the different parts of the double bridle and the horse bits attached. The two cheekpieces of the snaffle bridle attach to the curb bit, and the bridoon is attached to the sliphead and cheekpiece. The two headpieces and the head of the noseband are held in place by the browband just as on a snaffle bridle. It’s important to ensure that the loops of the browband are wide enough to accommodate the extra headpiece, as modern double bridles are supplied with browband loops too narrow, or one from a snaffle bridle which can be inappropriate. The sliphead should always buckle on the offside to balance the number of buckles on each side of the bridle. The two pairs of reins are attached to the bits, one set to the bridoon and one to the ring at the bottom of the cheek or branch of the curb bit. The two pairs of reins are often different, in that one pair will usually be either thinner than the other or will have some sort of grip added, either rubber or leather lacing. This is so the rider can distinguish between the bridoon and curb rein. When the reins on a double bridle are leather, as on a show bridle, the snaffle rein is usually slightly wider than the curb, so it is easier to hold and encourages the rider to use mainly the snaffle action of the double bridle. 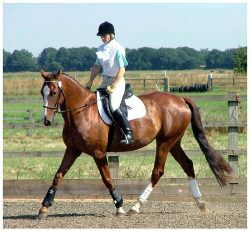 In dressage and cross country the snaffle rein is sometimes rubber coated to provide a firmer or stronger grip, and to reduce the likelihood of the reins slipping. Roundings or dees, or split reins, often used with the Pelham for riders who dislike using two reins, are never used on a double bridle, two reins should always be used. The double bridle uses two separate horse bits which are a combination of the bridoon snaffle bit, and the Weymouth curb bit which is fitted with a curb chain. The bridoon acts in exactly the same way as a normal snaffle by raising your horse’s head, while the curb bit acts on your horses poll and curb groove. Combining both bits in one bridle enables you to fine tune your horse’s head and neck carriage. NOTE … A double bridle should only be used on horses who are already well schooled, particularly for dressage and by experienced riders. 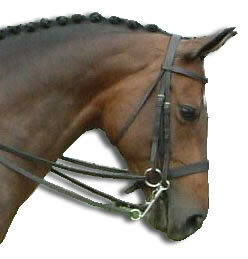 The double bridle is also considered the correct bridle for the show ring. The curb bit and bridoon should be arranged in the mouth so that the horse is comfortable and the bridoon lies above the curb, allowing both bits to work correctly. The curb chain attaches to the offside hook and should be twisted clockwise until the links lie flat, then hooked onto the nearside hook. The fly link (the loose link in the middle of the chain) should hang in the middle and the lip strap is threaded through and buckled together. A common misconception is that the lip strap is only necessary for keeping the curb chain in place, but its main function is to stop the cheek of sliding cheek curbs from inverting and rendering the curb ineffective, or from being dragged into the horse’s mouth. The curb chain, whether made of single link or multiple links, should always lie flat. A harshly used or incorrectly fitted curb chain can cause the most horrific injuries to a horses jaw. The bones under your horses jaw are very close to the surface, and the curb chain will not lie in the fleshy chin groove unless it is twisted correctly, meaning all the weight of the rider’s hands will be used against this thin covering of skin and nerves. The curb hooks should always be slightly bent to face away from the horse’s face, as they have been known to catch in the soft skin of the lip or cheek and tear it. The curb chain is essential on a curb bit, otherwise the lever action is dependent entirely on the headpiece. The chain can sometimes rub on a horse’s jaw, and some riders are never confident twisting the curb chain to lie flat. In these cases a rubber curb guard can be used. This fits over the chain and means it always lies flat and relieves the pressure slightly from the chin. It is also good practice to select curb bits where the upper cheeks of the bit have been angled slightly outward away from the horse’s face. Some hooks are also angled this way, although sadly not that often. 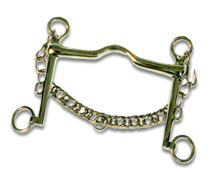 The bridoon bit is a thin snaffle bit, usually made with loose rings. The most common form of bridoon is a loose ring, followed by an eggbutt. It has a thin, jointed mouthpiece, and is often very light. It should be noted that the thickness of the mouthpiece will affect the horse, as although it is almost always a simple snaffle, being very thin, it will have a high ratio of pounds per square inch, and therefore will have quite a sharp action on the bars. A good rider can avoid applying too much pressure, and since a double should not be used by a novice or beginner this should not be a major problem, but it should be noted. The bridoon works just like an ordinary snaffle, its action being principally on the lips, at the corners of the mouth, on the bars, and on the tongue. Different mouthpieces and nosebands will alter the action, but the first point of action of the snaffle is when the head is raised against the corners of the mouth. Until full training is established the snaffle has an elevating effect on the head. Once the horse is consistently working in an established outline, with full self head carriage, the action of the snaffle, and therefore of the bridoon, is on the lower jaw, encouraging a retraction of the nose, and exerting less pressure on the corners of the lips. The Weymouth is the curb bit, which works on a lever action. The mouthpiece is effectively the fulcrum, the upper and lower cheeks the lever. The length of the shank below the mouthpiece determines how much action the cheek will have on the poll, rotating around the mouthpiece. The idea of the curb is, through pressure on the horse’s poll, together with the curb chain acting on the chin groove, to encourage the horse to lower its head. By doing this it is intended that the hind legs are brought more underneath, and the horse works in a more rounded outline. While the snaffle works on the horses muscles, the curb works on its skeleton, encouraging the horse to make full use of its back and body. or a bruised and broken upper palate and a ruined horse. Gradually the ports became lower and today’s ports are really designed simply to allow room for the tongue, especially useful in horses with big tongues for their mouths. Some riders prefer a half-moon or mullen mouth, which allows plenty of room for the tongue but which can pinch the cheek. At first glance, the combination of the snaffle and the curb are seen as contradictory; one encourages the horse to raise its head, the other to lower it. However, since the horse should not be ridden in a double bridle until the outline and self carriage have been established in a snaffle, the curb simply adds a degree of finesse to the aids given by a competent, sensitive rider, and allows more to be asked of the horse’s frame. Consider all your horse bit and bridle options and make sure you choose the correct type, size and combination for the sort of work you want your horse to do. Aciclovir cancer aciclovir alonga herpes z ster buy fluconazole online usa online buy aciclovir..